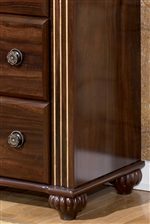 This traditional nine drawer dresser highlights the beautifully replicated mahogany grain and warm Dark Brown finish featured in the bedroom collection. Nine spacious drawers sprawl out across the dresser's generous surface, including three housed within the stepped out middle section for added depth in the center drawers. 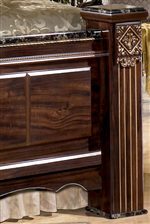 Framed top drawers with gilded bead detail draw the eye upward, where an elegant black marbled surface provides an ideal resting place for lamps, photos and decorative items. Exceptional workmanship and side roller glides make for effortless operation of all nine drawers. Antiqued gold hardware provides a polished finish to the entire piece. The Gabriela 9 Drawer Traditional Dresser with Marbled Top by Signature Design by Ashley at Walker's Furniture in the Spokane, Kennewick, Tri-Cities, Wenatchee, Coeur D’Alene, Yakima, Walla Walla, Umatilla, Moses Lake area. Product availability may vary. Contact us for the most current availability on this product. 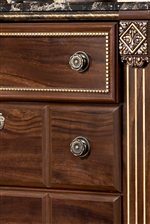 The Gabriela collection is a great option if you are looking for Traditional furniture in the Spokane, Kennewick, Tri-Cities, Wenatchee, Coeur D’Alene, Yakima, Walla Walla, Umatilla, Moses Lake area. 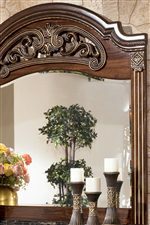 Browse other items in the Gabriela collection from Walker's Furniture in the Spokane, Kennewick, Tri-Cities, Wenatchee, Coeur D’Alene, Yakima, Walla Walla, Umatilla, Moses Lake area.